Not everyone has experience with playing cards. But the two experienced magicians pictured below, Andi Gladwin and Joshua Jay, are seasoned travellers in the world of magic and of playing cards. They specialize in close-up magic, have performed on major television networks, produced highly regarded teaching materials on magic, and are highly respected by their peers for their craft. So these guys know a thing or two about playing cards, and that includes producing them. In 2009, Andi and Josh teamed up in a commercial venture called Vanishing Inc Magic, which has not only published teaching materials for magic, but has grown into one of the biggest magic retailers worldwide. But for most of my readers who don't dabble in magic, but are boardgamers, it will especially be their enormous range of playing cards that will be of interest. They have an amazing range of more than 200 different decks of high quality custom playing cards available, with some absolutely beautiful decks among them. 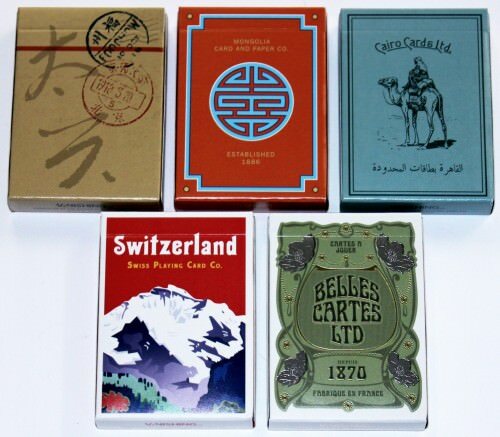 They have previously produced a beautiful deck called the Dapper Deck, and have now followed that up by creating a series of five decks entitled the World Tour Set, and it's these five newly released decks of playing cards that are the subject of this review. The World Tour Set of playing cards is so lavish, that it even has an official video trailer for it, which you can check out here. From that video, we learn that these five decks celebrate exotic places around the world. 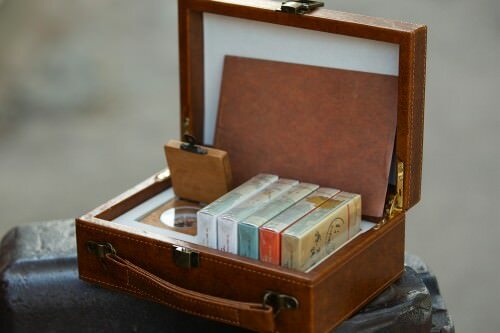 If you are prepared to drop a wad of cash to get the official and complete World Tour Deck Set, you'll also get a miniature travel trunk which houses all five decks. It's a lovely piece of creativity that enhances the thematic concept behind this collection of decks, and even comes with some separate decals corresponding to the exotic lands that these cards have visited on their way to reach you, the collector. These decks aren't just a set of playing cards, but they tell a story. The World Tour deluxe set is described as "more than a collection of cards - it's an adventure". The premise behind them is that Ezra the Great is travelling the world, performing his show in 1902. Along the way, Ezra buys decks of cards, which he sends to us. So the suitcase which holds the five decks also includes a compass, plus reproduction letters from 1902 that commemorate where each deck came from. Apparently the collectible pieces that are part of this set were manufactured all over the world, to help give it an authentic international flavour. As the ad copy describes it, these include "handwritten notes written on railcar stationary, coasters, tickets, and hotel paper...are included, to help immerse you in the spirit of the turn of the century, and how Ezra might have obtained each special deck." 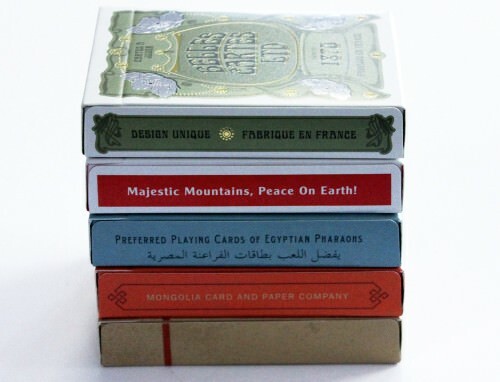 Each of the five decks corresponds to a different country: France, Switzerland, Mongolia, China, and Egypt. 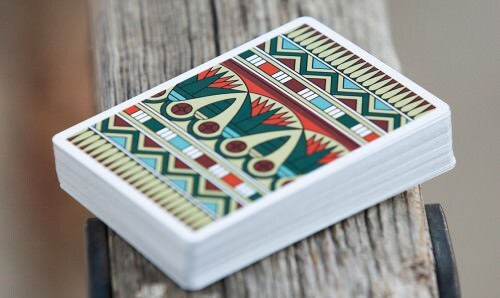 Each deck is also available individually, and has been cleverly crafted with artwork and a design that reflects different elements of the lands, cultures, and time period that they come from. 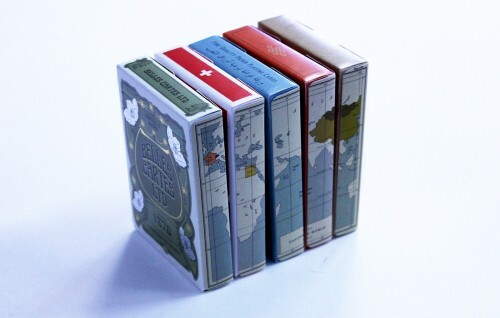 One nice thing about all five decks is that when you place them alongside each other, they create a map of the world which includes all the above-mentioned countries. So let's tell you something about all the individual decks, and show you what they look like, as we pack our bags and get ready to travel the world along with Ezra the Great! "The box is the main feature on this deck, with silver foil and a classic art deco design. 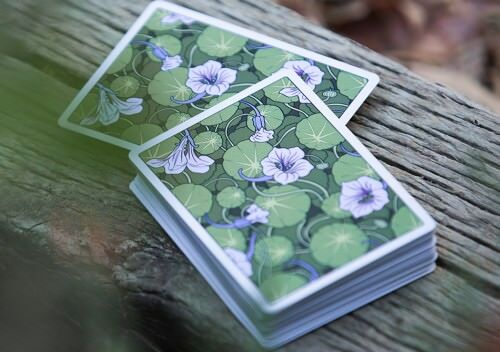 The cards have a simple floral pattern that is neither flashy nor boring, but would blend in the sort of turn-of-the-century cafe magicians and card players would patronize during the period." The tuck box does indeed look exquisite, and the touches of gold and silver produced by foil accents adds real style and beauty to the art deco design - an appropriate choice given the French origins of this art movement. In keeping with this theme, the side of the tuck box reads "Design Unique - Fabrique en France". 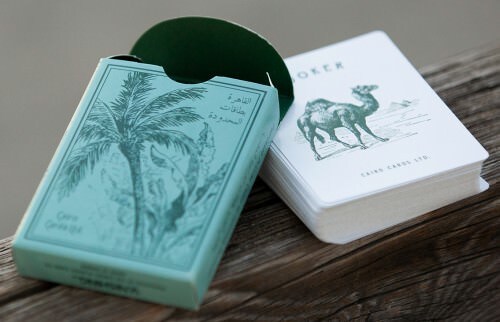 The pale green also adorns the inside of the tuck box, and brings to mind the colour of vegetation and foliage. So it is no surprise to see the card backs covered an attractive water lily design, complete with soft pink/purple flowers. Even though it is a one-way design, it looks lovely in fans and spreads. The green and pink/purple are also the two main colours of the card faces, corresponding to the traditionally black and red suits that make up a deck. The court cards have a truly retro look that matches the theme and location well, and seem to be inspired by the designs and style I've seen on older and classic French decks. As we'd expect, the pips are completely custom, and have been designed to match the overall "old-world" feel of the deck. 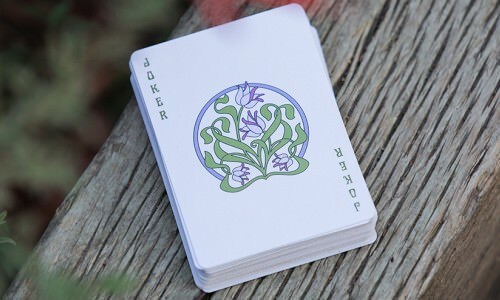 To round out the deck, two matching jokers both feature a floral theme that complements the card backs beautifully. 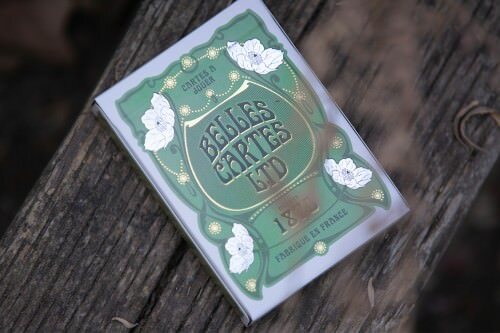 The France deck makes a fine beginning to our world tour travels, and truly evokes something of a turn-of-the century set of playing cards that captures a very French style. "Inspired by the iconic travel posters around 1902, this retro-back design advertises the Swiss alps, in saturated colors and bold text, alluring the beholder to explore the treacherous but beautiful scenery Switzerland offers." 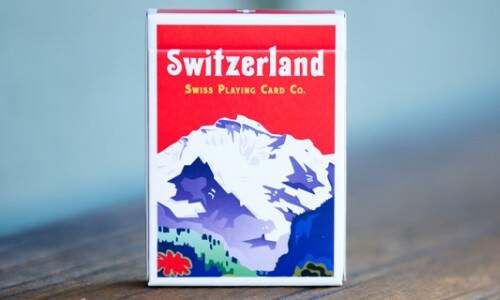 The tuck box makes use of a simplified colour palette which emphasizes the signature view we've all come to associate with Switzerland: the Alps. The side of the tuck box adds to the focus on breath-taking Swiss scenery with the words: "Majestic Mountains, Peace on Earth!" Tucked safely inside our impressive view of the mountains are 54 cards. The pips employ a very bold red and black, with a very matter of fact and distinct shape. It's immediately that we've left the art-world of France behind, and are now concerned with being practical and down-to-earth - even when our head is in the clouds while walking on mountains. The back of each card is emblazoned with a one-way artwork scene that matches what you see on the back of the tuck box. Apparently in this country, wherever you look, you see mountains. The court cards do a good job of reminding us that we're in Switzerland, because they feature various elements typically of the culture we see here. Instead of personages, our Kings, Queens and Jacks each feature the name of a Swiss city like Lausanne, Zurich, Geneva, or Basel, along with something we might see on our Swiss adventures, such as a set of skis, a dairy cow, a watch, a mountain goat, and more. 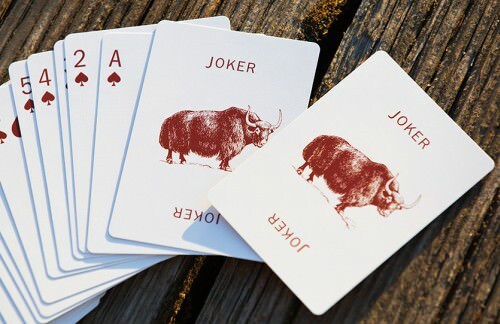 As for the twin Jokers, these both depict the iconic red and white Swiss flag. 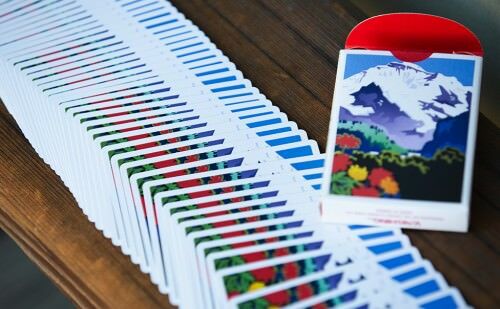 Like the mountains, these are the two colours that are ever-present wherever we look in this deck, even inside the tuck box! "This back design is understated and two-color, with appearances by camels and the great pyramids. It is quite similar to card designs one would see on caravan rides that transported the earliest Egyptologists from Cairo to the Valley of the Kings." 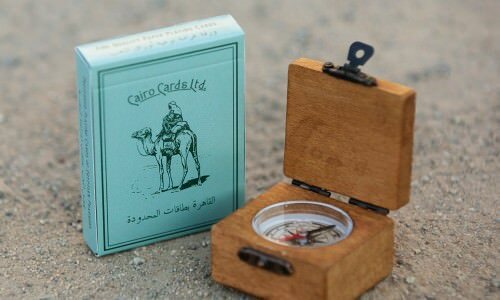 Courtesy of Cairo Cards Ltd, we now head to Egypt - where of course the preferred means of transport requires us to hop aboard a local camel, as pictured on the tuck box cover. The back of the box reminds us that not all of Egypt is desert, and if we know where to look, there might be an oasis with palm trees to be found. Perhaps it will help if we have good company along the way. As the side of the tuck box reminds us, these are "Preferred Playing Cards of Egyptian Pharaohs". Whether it's native Egyptians or visiting Egyptologists, as long as someone knows the route! The back design is one of my favourites in the series, and although it is a one way design, it features a simple yet inspiring pattern that is suggestive of ancient mosaics, and the artwork one might find in this part of the world. 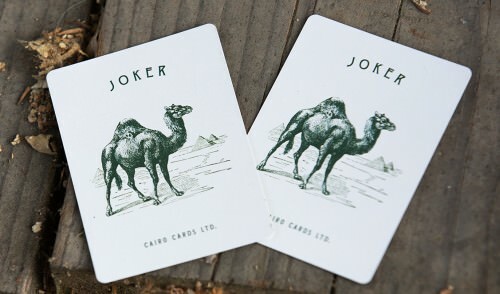 The two main colours of the face cards are an earthy red (hearts and diamonds), reminiscent perhaps of desert terrain, and the dark emerald green (spades and clubs) that is used on the tuck box. I especially appreciate the court cards, all of which feature Egyptian images, and really help bring this exotic location to life. 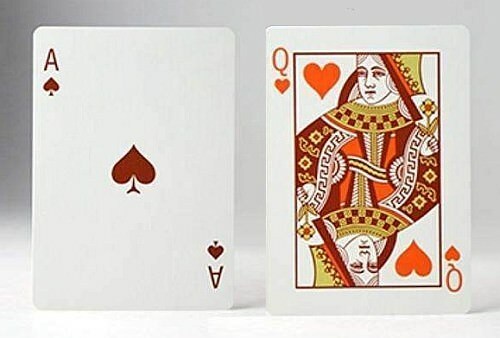 A somewhat surprising choice has been made to have the court cards of the spades and clubs match, and the same with the court cards of the hearts and diamonds, meaning that their are six unique designs in total. The font used on the indices is also stylized, and fits well with our Egypt encounter. As we farewell Egypt, our last view is of the two matching Jokers, which both feature a lonely camel, with the pyramids fading from view in the background. We've enjoyed our stay, and undoubtedly we'll be back to play with this deck some more on another day. "This is everyone's favorite design. Modelled after a "Peace" symbol we located on a piece of antique Mongolian furniture, this deck's simplicity and color palette have made it a favorite amongst collectors, and the most requested back design Vanishing Inc. have ever created." 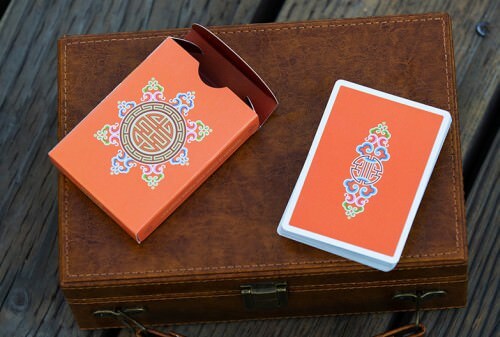 The tuck box of this deck immediately confronts us with the memorable ochre that many of us associate with Mongolia - many Mongolians love the colour orange, and it occupies a dominant place here. 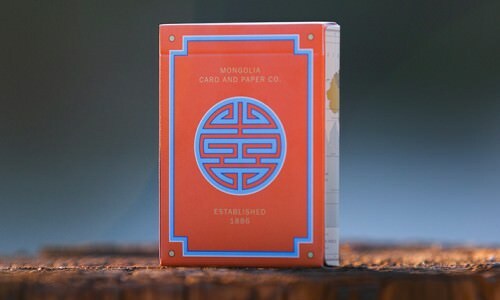 The tuck box leaves us in no uncertainty where we are, with the faux origin being credited as "Mongolia Card and Paper Co, Established 1886". The unique design on the tuck box almost has a floral feel to it. 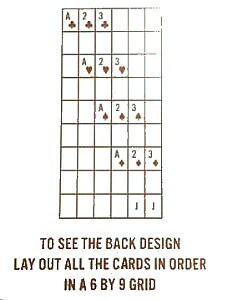 The design on the card backs shares some common elements with this, but has its own shape and pattern, suggesting simplicity combined with style. The court cards will look immediately familiar, with the shape of our characters being clearly taken straight from traditional courts - the only difference is that they are dressed in orange and brown. Even in strange lands, beneath the unfamiliar clothing of the local inhabitants, are people that are still very much human like us! The Hearts and Diamonds all use orange pips, while the spades and clubs have a dark brown. The dark brown also makes an ideal choice for our mono-coloured Jokers, both of which depict the Yak, a close relative of buffalo and bison, and a creature we are almost certain to see during a Mongolian visit. "This unusual deck boasts a back design that isn't a design at all. 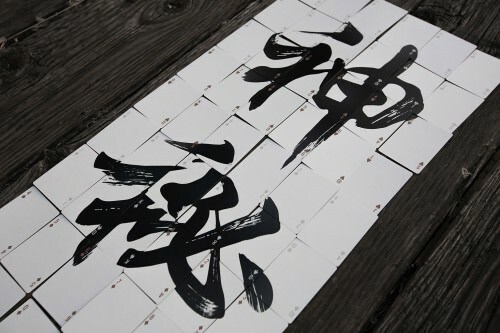 Instead, when all the cards are arranged in new deck order, in a grid, they create a mosaic of the Chinese character for Mystery." From Mongolia we head to our final stop, which is China. 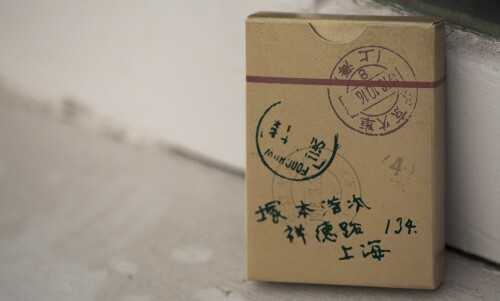 The tuck box looks like some ancient manuscript we might expect to find in Asia, and even though Westerners like me have no clue what the characters on it mean, they leave us with no doubt about which part of the world this has come from! Our uncertain and confusion doesn't disappear once we start exploring the contents inside the box, because what confronts us here is somewhat of a puzzle, and certainly something that we see very little of in the playing card industry: all the card backs are different! They have swirls of black on a plain white background, and despite the minimalist colour scheme, at first we struggle to put the pieces together of what is going on here. But wait ... that's it: put the pieces together! See, if you stay in a foreign country long enough, eventually you get to learn the language, and the strange gradually becomes familiar. The challenge here is to piece together all the cards, which can be arranged adjacently in a 6 x 9 pattern like a puzzle, and they'll produce a single image that has some more Chinese characters for us. Fortunately an interpreter is close at hand in this mysterious world. In lieu of one of the Jokers, a card is provided that will help us translate this confusing collection of pieces into a single whole, if we follow its instructions carefully and successfully `translate' our individual puzzle pieces into a single whole. The face cards all have indices, in which an unadorned and plain font and pips do give each card a recognizable identity, in orange and silver colours. But the real feature of these faces is that they, too, can be arranged into a single image. While unusual, this is certainly a memorable deck that is sure to make an impression on people due to its uniqueness, and is a true novelty item. Concept: I love the thinking that has gone into this project. The World Tour Set option that comes with the miniature suitcase, compass, and various other collectible extras will be beyond most people's budget, but certainly it is a fantastic idea, and undoubtedly there are discerning buyers who will jump at this. Personally I just have the five decks themselves, but even without the travel trunk and additional ephemera, the concept of a world trip still is very present, and adds to the appeal. Culture: I particularly appreciate how each deck has cleverly integrated various aspects of the different culture and country that it represents. 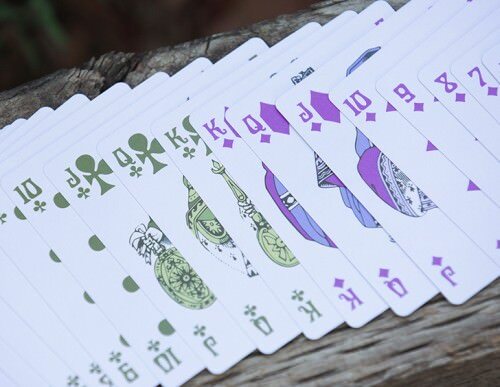 There's been close attention to all the details, including the choice of colours, the overall design, the artwork of the court cards and jokers, style of the pips, and even the font used for the indices on the cards. The entirety works together brilliantly to evoke a single theme, revolving around the country that each deck features. This has been done superbly, and kudos to the creators for achieving this so well, so that all aspects of the design contribute to creating a single unifying idea. Style: These decks look stylish the moment you first see the tuck box. It's immediately obvious that these are not just a simple variation of something often done before, but they stand out as stylish and unique, especially when placed alongside each other. The sense of style continues when you look at the cards themselves, and the degree of customization that is present on the card backs and faces of the cards all contributes to produce something that feels truly one-of-a-kind. 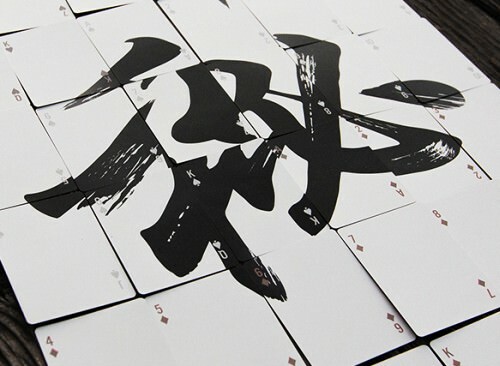 The unique card backs also lend themselves to beautiful fans and flourishes, although I'm the one-way design of some of these decks means that a good shuffle can mess with that. Variety: Sometimes a series of decks merely features variations on a common theme. 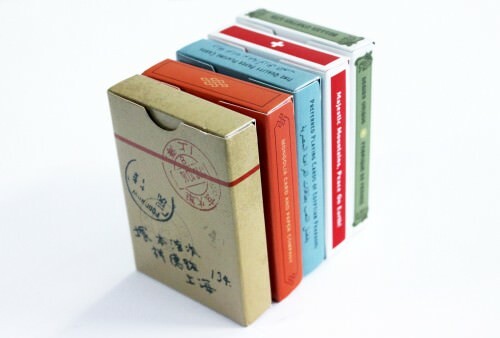 Because each of these decks focuses on a different country, each deck feels singular and unique, being very different from each other. Together they make up a set by virtue of the travel and country theme, but they are very much individual products that can be appreciated independently, since there is very little overlap between them. Collectable: Only 1500 of each deck were printed, and this is a one-time production that will never be printed again, making these decks ideal for the discerning collector. They also work together as a set, and their collectability has been enhanced by having the sides of the decks producing a single panoramic image of an old world map. If you have one, you'll likely want at least one of the others, maybe all of them! 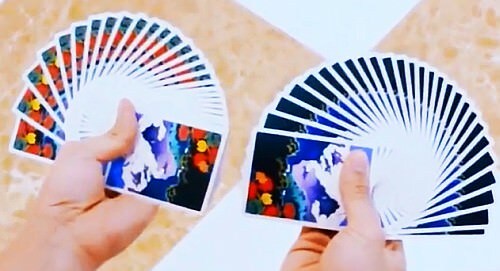 Some of the decks are especially geared to collectors, especially the unique China deck, in which all the cards can be pieced together as a puzzle. But to some extent the entire set will have a real appeal to collectors, especially those who appreciate the novelty that is represented here. Practical Despite the individual and custom feel of each deck, these are mostly still very usable decks for playing card games or performing card magic - the China deck perhaps being an exception. But that deck aside, the card backs are in no way outlandish, and the thin borders help create a visual sense of style and elegance that makes them very workable. The colour choices and design are certainly somewhat novel, but they don't feel so customized or unusual that makes them unsuitable for use in the real world. Even the shape and style of the pips - while heavily customized - is still familiar enough to ensure that these are not mere collector's pieces, but can actually be used for games or magic. The court cards in some of the decks lean more to the heavily customized side, but if you want more traditional courts, there's the Mongolia deck that offers that. Quality: The playing cards themselves have been printed by the Expert Playing Card Company (EPCC) with what appears to me to be their hard-wearing Master finish. 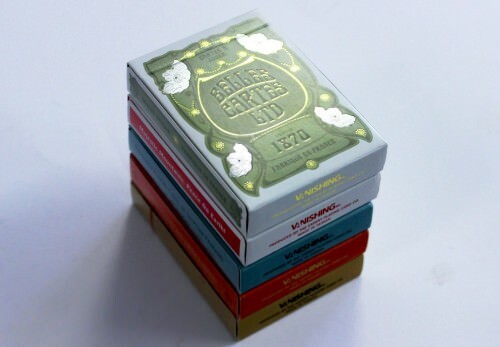 EPCC is an industry leader with a proven track record of success in producing high quality playing cards. Particularly given the very narrow white borders in these cards, going with EPCC was an excellent choice, given their fantastic record with precise printing and perfect registration; it is hard to imagine USPCC doing as fine a job with narrow bordered cards like this. 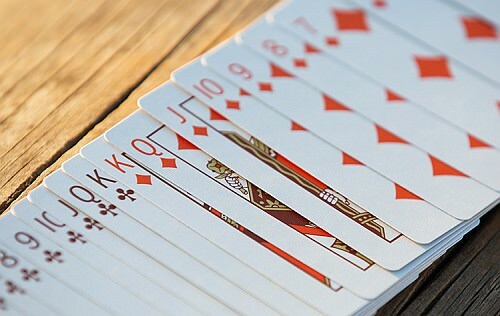 The cards also handle and shuffle smoothly and cleanly, and although the smoother Master finish can take some getting used to if you're only familiar with Bicycle decks, it is a quality finish that many custom playing cards have been produced with. Affordable: As mentioned already, the luxury end of this range of products is the World Tour Set, which is priced at a relatively steep $100, but will be hard to justify for the average person. But the individual decks are priced at $10 each. 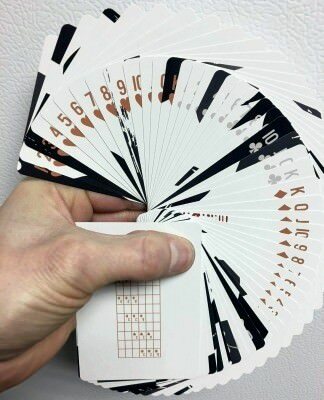 In today's market place, it is common to see custom playing cards sell for at least $15 each, so this is definitely at the lower end of that price bracket. Considering that you get an attractive and quality product, this is a comparatively good price. I'm very impressed with the World Tour Set from Vanishing Inc Magic. It's hard to pick a favourite deck, although I find myself particularly drawn to the Egypt deck, due to its colours, patterned card backs, and Egyptian themed court cards. The France deck is a close second, due to its unique beauty and appeal. 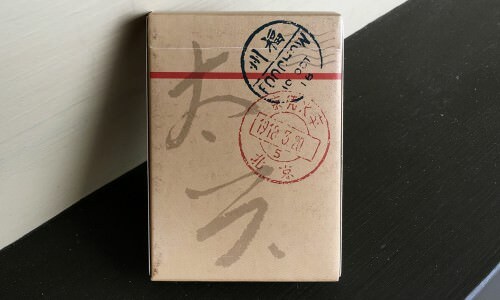 The China deck stands out as a rather unusual entry in the series, especially since its back designs make it mostly unsuitable for use in playing card games or performing card magic, so it seems more geared as a novelty item for the collector. 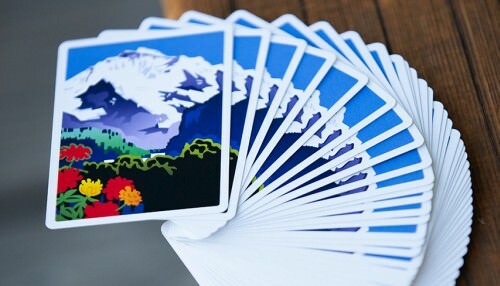 In contrast, the Mongolia deck has a much more standard look, and along with the France deck is probably one of the ones that is the most ideal for practical use; although the Egypt and Switzerland decks have their unique beauty and appeal as well. After the success of their stylish Dapper decks, with their World Tour decks the team at Vanishing Inc Magic has contributed another classy product to the playing card industry, and I look forward to see what they come up with next!